What happens when you have a potential tenant but they don’t want to be screened? In many cases, the tenants that don’t want to fill out background information or have you run a tenant background check have something to hide. Not knowing who is moving into your rental property can leave you and your assets at risk. That’s why it’s so important to consistently screen all potential tenants. Here are the top three benefits of screening tenant leads. Your rental property makes you money. The better you take care of your property, the more it will appreciate over time. While you can do everything in your power as a landlord to keep your property nice, the bottom line is you aren’t the one living in the space full time. Screening tenant leads can ensure that you have someone that will respect your property and keep it looking nice. Having a quality tenant can make all of the difference when it comes to how much your property will be worth in the future and if future tenants will want to live there. Along with securing your cash flow in the future, screening your tenant leads can help your income now. A high tenant turnover rate can do more damage to your finances and your property than good. Screening your leads and ensuring that you have a quality tenant can help save you money on property damage and possibly eviction cost. Also, having a great tenant means a consistent cash flow of rent. Finding a long lasting tenant is a gold mine for a rental property owner. A long lasting tenant means a consistent cash flow, less property damage, and less stress of having to find future tenants. It also just makes everything easier to have a long lasting tenant because of the trust that is built there. Screening tenant leads can help you find the quality tenants that last. When it comes to tenants, it’s important to know who you are renting to. Screening tenant leads benefits you by protecting your assets, increasing your income, and finding you a long lasting tenant. 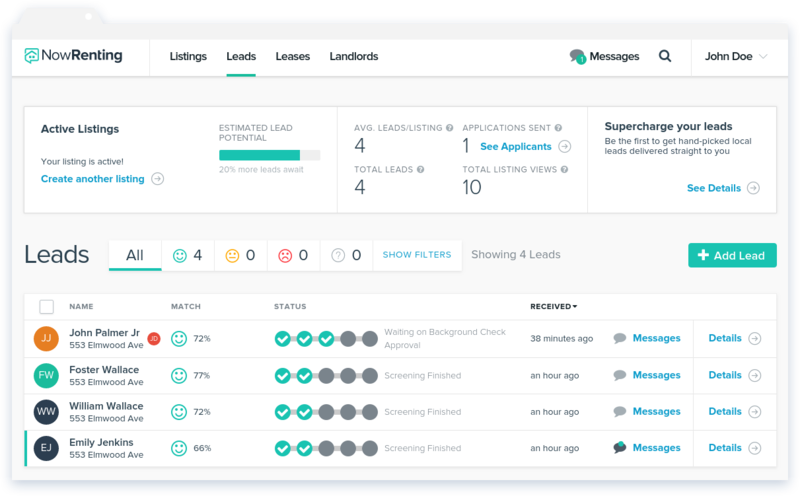 At NowRenting, we know how important it is to screen your tenant leads. We provide efficient online tenant screening and give you high-quality leads directly to your inbox. We want to make sure that you have the best tenants possible. To learn more about how Now Renting can benefit you, contact us today at 844-446-RENT.